To understand the health system and public health in rural Bangladesh, AIUB students of Masters of Public Health (MPH) department organized a field visit to Dhamrai Upazila Health Complex, Union Health Complex, and Chapil Community Clinic and Sombhag Union Health and Family welfare center located at Dhamrai, Dhaka to explore locals’ participation in health services through personal interviews as well as case studies. The field visit started in the morning around 8:00 am from the university premises and students were accompanied by Dr.A. 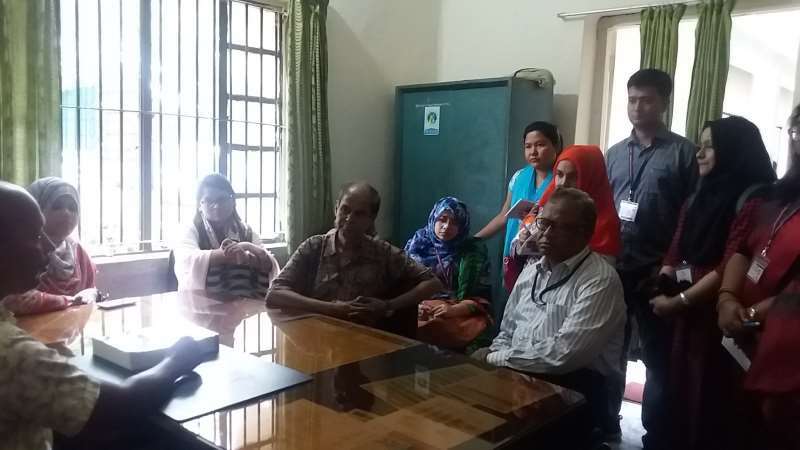 N Neaz Ahmad Advisor and Professor, Dr. Pradip Sen Gupta Adjacent Faculty and Ms. Monidipa Saha Program Officer The objectives of the visit is, • To understand the program functioning and management of Upazila Health Complex,Union Health complex and Community Clinics of Bangladesh. 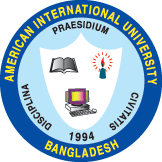 • To support students to learn hands-on in order to understand the public health status of Bangladesh. 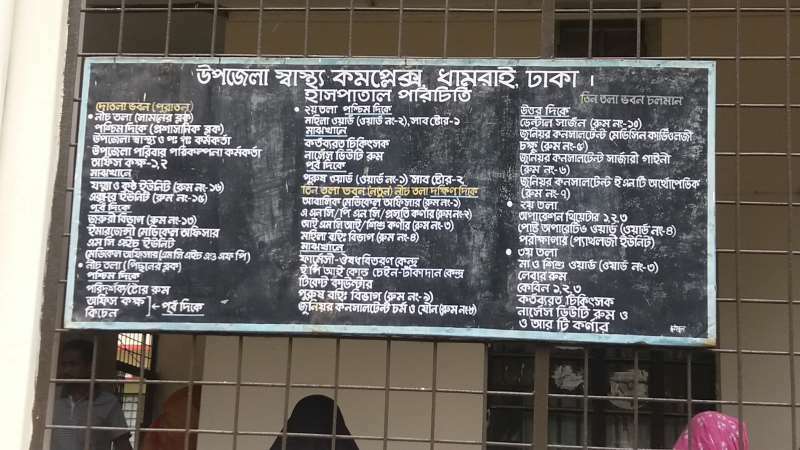 The Government provides healthcare services to its rural people through health facilities at a smallest administrative unit called Upazila Health Complex (UHC). UHC provides outpatient care, primary healthcare, family-planning services, and other preventive healthcare services to the community. 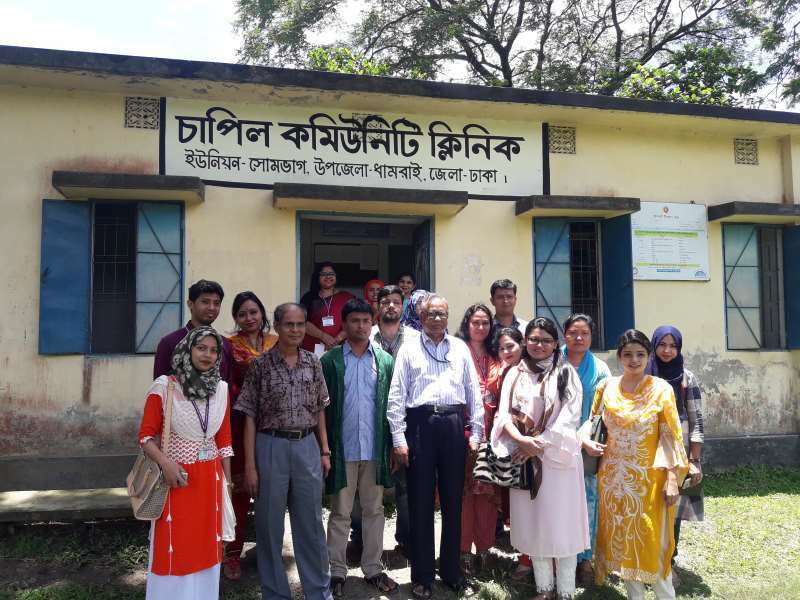 MPH students were briefly introduced to the Dhamrai Health Care facility by Dr.Iqbal Kabir (FR),Ms. Tania Parvin (UFPO), Ms.Momtaj Akhter (AUFPO). Ms.Momtaj Akhter showed us their working areas, training schemes and then explained work procedures which includes maternal and child care, vaccinations, ANC, PNC services along with health education campaign on pregnancy care, family planning, Contraceptives distribution etc. They also provide 24/7 days support to pregnant women. 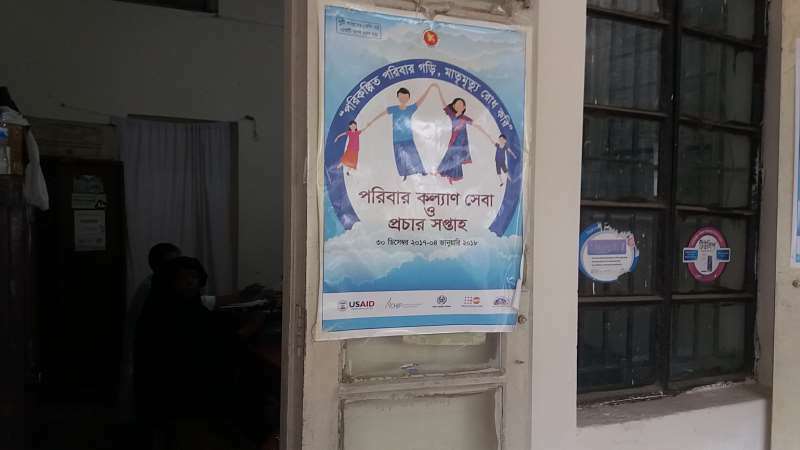 UHCs represent 31% of the government health sector, signifying their importance as a major contributor to healthcare service in Bangladesh. Medical graduates, along with the paramedics and nurses supported by personnel for laboratory services and supplies, are responsible for healthcare services provided by the UHC. After visiting UHC, students visited Chapil Community Health Clinic.MPH students get to know about Community Clinic through Mr. Shams Uddin, a community health clinic provider. He describes MCH-FP services through home visits, EOC services with provision of Skilled Birth Attendants (SBA), Antenatal screening, PNCs, referral methods for safe delivery, contraceptive supply (pill and condom) etc. He mentioned that many non-governmental organizations (NGOs) also provide healthcare services through community clinics. Through him students got to know that, UHCs are also the referral centers for a number of grassroots-level community clinics. Bangladesh is on track in terms of achieving MDG targets particularly MDG 4 & 5. In order to reduce fertility rate, mortality rate, Neonatal mortality rate and further Infant Mortality UHC and CC are playing a strong role achieving development goals. Through this visit MPH students gained in-depth knowledge about the existing health services and helped them determining the goals in Bangladesh. The field visit helped them to be aware about formulated policies to ensure essential services, strategies to ensure hospital-based services for localities, structural design planned for human resource development and also to gain integrated knowledge of NGOs and the Private Sector and of plans for resources and utilization of funds in Bangladesh.